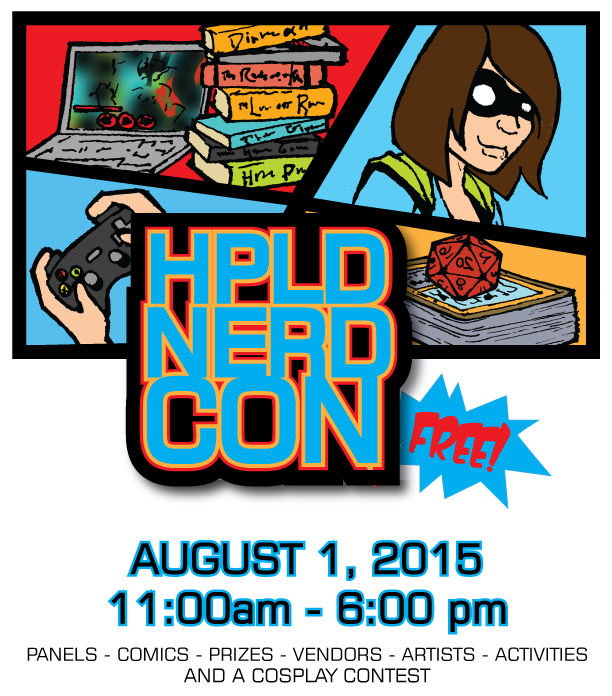 Remember that crazy time last year when I convinced everyone at my library that it would be a fun idea to host our own Comic Con? Well they must have forgotten just how crazy it was, because I managed to persuade them to do it again this year. But this time it was WAY bigger. Like new location bigger. And it was way better. 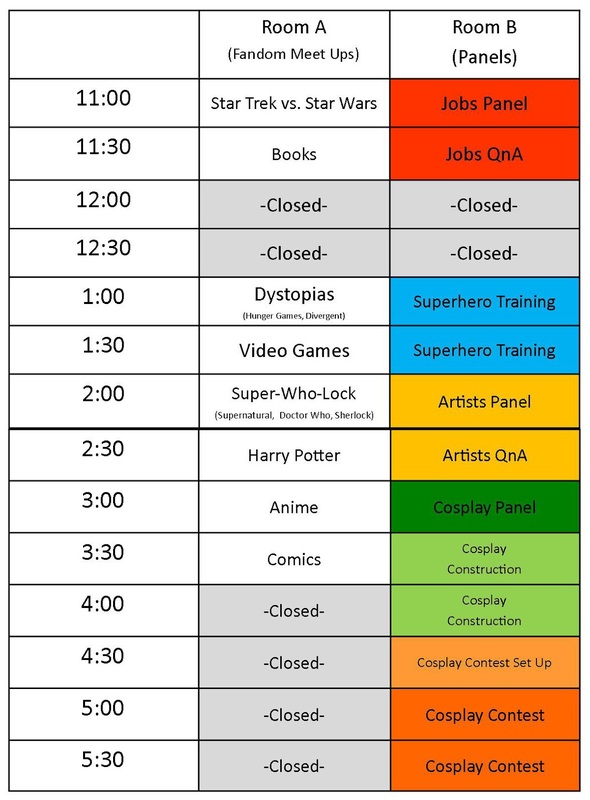 Like, full schedule all day and a cosplay contest better! Yeah, I wasn't kidding about the full schedule. We had decided last year that we wanted to make sure to have activities running constantly, so a person could potentially come at the beginning and have something to do all day. Panels seemed like a fun and sneakily educational way to fill some time, so I tried to pull in some people with experience to talk. Then, during one of our teen board meetings, the suggestion of a fandom meet-up was given a huge thumbs up, so we ended up using both ideas. 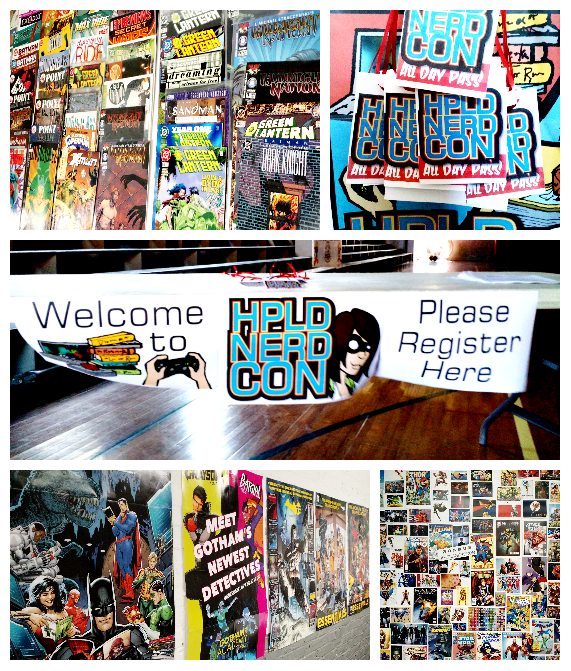 On top of the scheduled events we also had vendors set up upstairs, a place to get freebies (such as comics), an "active" area set up with 4-square and other various games, board games available for check out, a photo booth, and a room with movies running all day. We really wanted to make sure that no one was ever bored. The panel room was led by one of our college kids. I had lined up the panelists beforehand, trying to make sure we had a big variety. One of our speakers had a family emergency come up the day before the con, so I had to think on my feet and ended up replacing him with our drama club's costuming genius (aka my mom, who has all the knowledge she needs for a cosplay panel). We had a few other speakers as well, including a photographer, a librarian (duh), and an amazing artist. 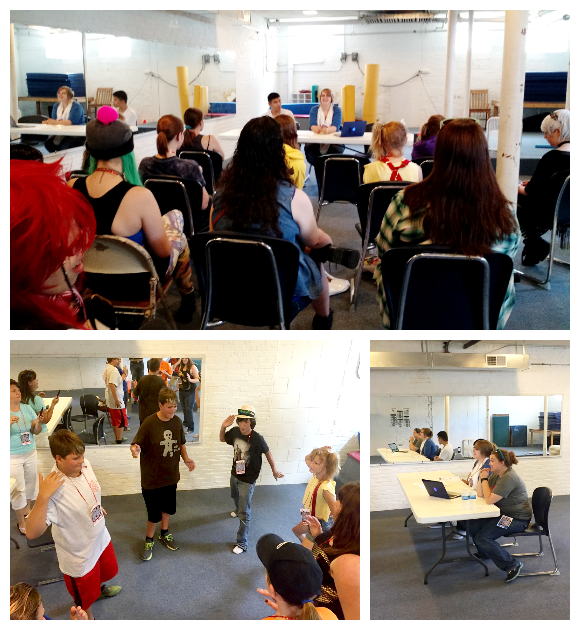 We also had "superhero training" which basically consisted of an obstacle course and a huge game of ninja. My sister took care of the fandom room. We had a prize set aside for each meet-up, and she also planned out a little game for every fandom (I totally wanted to play the Harry Potter one). This room was a huge hit, and so easy to put together. I think the kids just like a place to hang out with people who are into the same things as them. Wouldn't you? The biggest problem we had was that people wanted to be in two places at once! 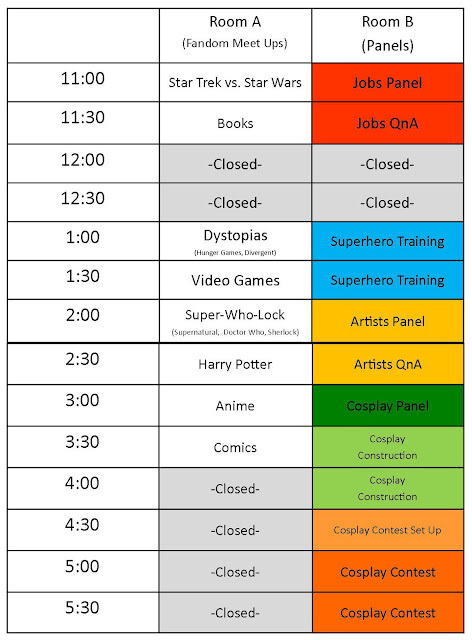 If we do it again we are going to try to alternate panels and meet-ups, keeping them at about thirty to forty-five minutes each. We tried to have a lot of vendors this year, which basically meant a lot of networking for me. I went to a few local cons and asked people from out of town to come and set up booths. Two people showed up (including a professional artist named Jeremiah Lambert), and I am forever grateful for the variety they added to the event. I asked people from in town to set up tables as well. 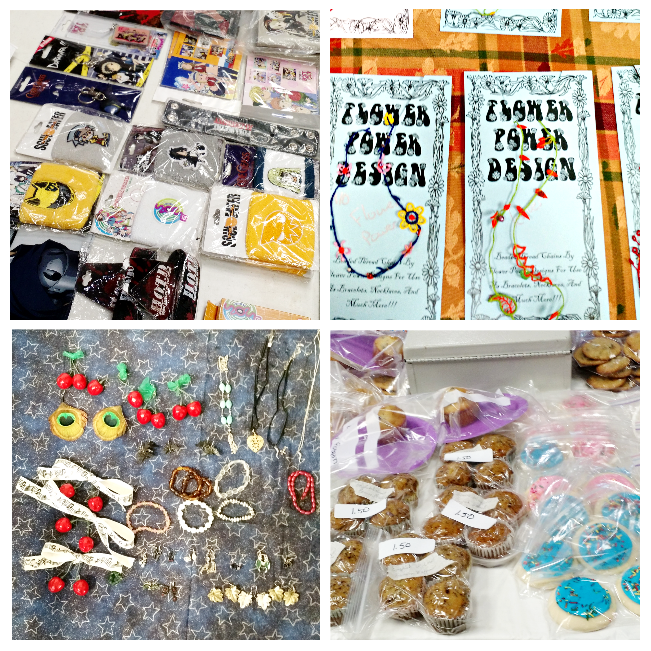 We had a few local artists (some of the students from last year) and a few crafters (you can see their accessories in the picture above). The high school dance squad set up a bake sale, which was awesome when it came time for lunch. 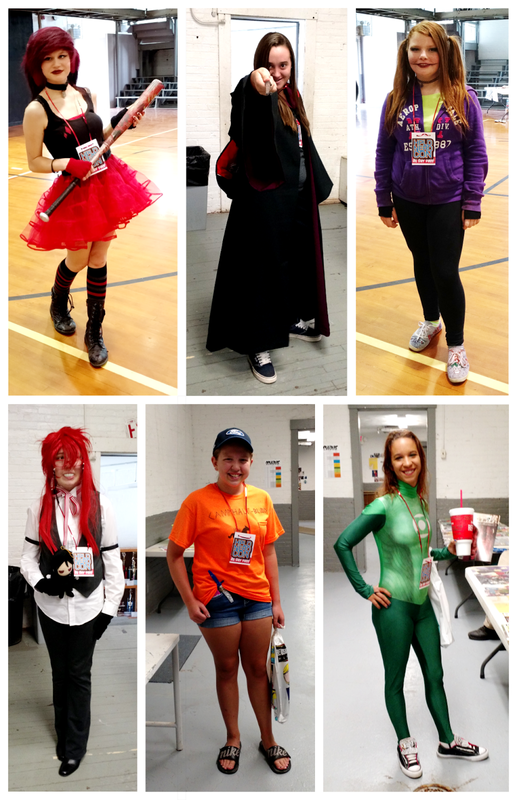 We finished up our day with a cosplay contest. 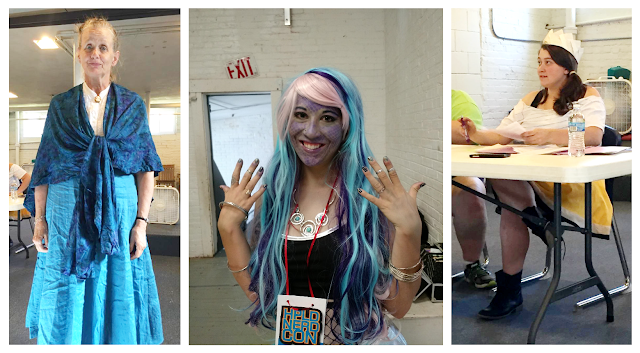 Just like last year, the amount of awesome cosplay we had blew my mind. How adorable is that Harley Quinn (first one, red skirt)? And that Annabeth Chase (from the Percy Jackson series, orange t-shirt) made me squeal out loud. The winner of the contest was Grell from Black Butler (the one with the vest and the red hair). Her costume was so close to the reference, and you could tell she loved the character. -Air conditioning is your best friend. Especially if you're hosting the event on August 1st. Even if it's nice outside, you'll be roasting inside. And that's not fun when you're dressed up in cosplay, which usually includes multiple layers. -You WILL dedicate hours to an event this massive. You will be at the venue the night before for hours, and be cleaning up for hours after the event is over. It's just how these things work. -While normal PR is great (we sent out a PR packet to all the surrounding libraries, and got many excited responses), nothing beats word of mouth. I teach art lessons in a neighboring town, and I got multiple groups to come because I was able to explain in person just how awesome this event was going to be. If I were to do it again I'd love to take the time to go to the other libraries and hand deliver posters, just for the opportunity to talk up the event. -Put a staff member in charge of every room. I did this, and let them know very early on what their responsibilities would be. For the actual day of the con I prepared a crate for each staff member including the materials they would need (signs, prizes, dvds, ect. ), and gave them a letter at the beginning of the day that outlined their responsibilities and thanked them for being such seriously amazing people. Delegating like this took a lot of pressure off me, insuring that I could run around and make sure everything was running smoothly instead of being stuck in one room for extended periods of time. Also, I had one person on staff that didn't have any set job. 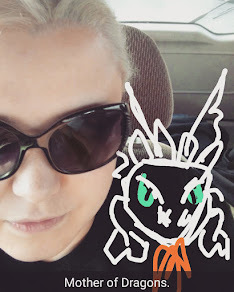 She would sub in for people so they could go eat lunch, speak at panels, or just enjoy the con in general. -Have self-running activities. All we had to do for the board games or the active games was set out the supplies. They could figure it out from there. It was great for the down time. We also had a few places downstairs where people could create their own comics, or color their own cards (like Magic the Gathering). More than once I walked in the room to find a parent coloring while they waited for their child. -And of course all of the tips from last year still apply. If this seems like too big of an event for you to take on, check out last year's post. 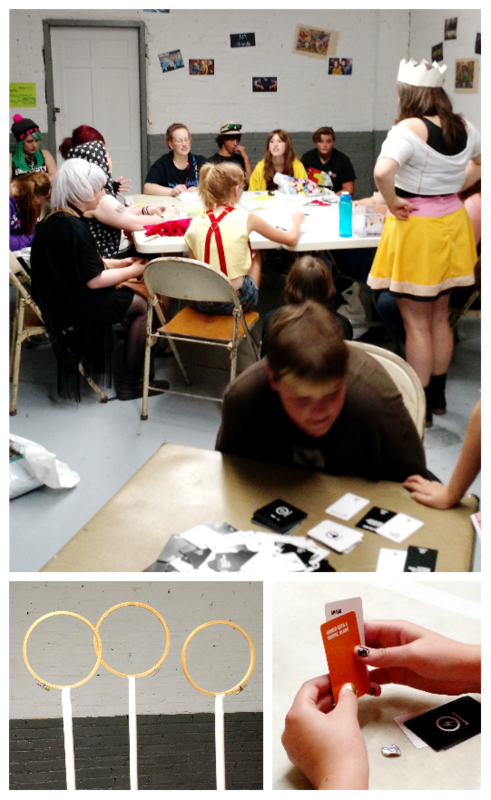 Our event was much smaller, but just as fun! So... in the end, was it worth it? YES. Definitely. 100% would do again. If you have any questions about the event, or you were there and think I missed something really important, leave me a comment! I'd love to hear from you!